USA’s Joshua Farris captured his second consecutive Junior Grand Prix gold medal in Bled, Slovenia. The 2012-13 ISU Junior Grand Prix of Figure Skating continued this week in Bled Slovenia, with approximately 95 skaters/teams representing 35 countries competing in the Men, Ladies, and Ice Dance disciplines. The athletes competed to earn points towards qualification for the ISU Junior Grand Prix (JGP) of Figure Skating Final which will be held in Sochi, Russia in December. 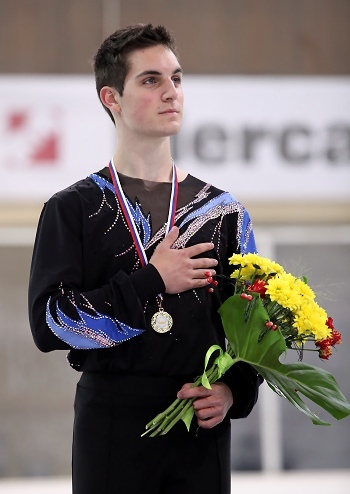 USA’s Joshua Farris won his second JGP gold this season with over 24 points to spare. Boyang Jin of China rose from sixth to clinch the silver, while Russia’s Alexander Samarin rose from fifth to capture the bronze in his JGP debut. Farris gave a flawless short program which featured a triple Axel, triple Lutz-triple toe, and triple flip. The current World Junior silver medalist showed solid footwork and spins in his somber routine to selections by Yo-Yo Ma, earning 74.35 (40.56/33.79) points for a first place finish. Han Yan of China popped his opening triple Axel, but otherwise landed a solid triple Lutz-triple toe and triple flip in his passionate “Jealous” routine. The World Junior champion also showed strong level three footwork, earning positive GOES across the board, and placed second with 65.66 (31.98/33.68) points. Japan’s Keiji Tanaka landed a triple toe-triple toe and triple flip, but stepped out of and put a hand down on the landing of his opening triple Axel. The 2011 World Junior silver medalist otherwise earned positive GOEs for his level three footwork, and was awarded third place for his charming and confident “Afro Freak” routine. He scored 61.83 (32.33/29.50) points. Teammate Shoma Uno nearly tied for fourth place with 61.42 (32.56/28.86) points in his dramatic short to Tanguera. The 2012 Youth Olympic Games junior silver medalist landed a triple toe-triple toe, triple flip, and double Axel, displaying strong spins and footwork throughout. Samarin took an edge call on his opening triple Lutz (in combination with a triple toe), but landed a triple flip and double Axel. The 14-year-old also showed very good spins and footwork, earning 60.81 (32.64/28.17) points for a fifth place finish. Jin underrotated and two-footed the landing of his opening triple Axel, but landed a triple Lutz-triple toe and a triple flip for sixth (58.10). Farris gave a contemplative performance to a Rachmaninoff piano concerto piece, landing a total of six triple jumps. However, he fell on his on his opening triple Axel, opting for a follow-up triple toe instead of a planned quad while he regained his composure. The current JGP Final bronze medalist displayed good footwork and also earned positive GOEs for his high level spins, placing first in the long with 136.86 (67.84/70.02) points, and overall (211.21). Jin, who stood in sixth after the short, underrotated his opening quadruple toe in his whimsical Charlie Chaplin routine. The 14-year-old from Harbin also had a couple more stumbles, but otherwise landed five triple jumps—including two Axels. He finished second in the long with 128.35 (68.27/60.08) points, and with a total score of 186.45, rose to second overall. Samarin received an edge call on his opening triple Lutz (in combination with a triple toe), but was otherwise solid in his military-themed routine to music from the Admiral soundtrack. The Russian teen landed five more triples and earned a level four on his intricate spins, placing third with 122.22 (62.88/59.34) points. He rose from fifth to third overall (183.03) to win the bronze in his JGP debut. Tanaka, who stood in third after the short, struggled on several of his jumps in his routine to music from The Untouchables soundtrack, landing only four clean triples. The Japanese junior silver medalist placed fourth with 118.94 (57.02/61.92) points, slipping to fourth overall with a total score of 180.77 points. Yan fell on an underrotated quad toe and triple Salchow in his routine to Masquerade Waltz. The Chinese bronze medalist also stepped out of his opening triple Axel, but impressed the judges with his level three straight line steps for a fifth place finish (115.03). With a total score of 174.34 points, the 16-year-old slipped from second to fifth overall. Uno finished sixth overall (174.34), followed by Charles Tetar of France (156.43). Both Farris and Jin have qualified for the upcoming JGP Final in Sochi in December. Samarin is currently schedule to compete next week in Zagreb at the 2012 Cup of Croatia. Hae Jin Kim of South Korea won the ladies title at the 2012 Sencila Bled Cup in Slovenia. Hae Jin Kim of South Korea pocketed her first JGP gold at this event, while USA’s Barbie long won the silver in her debut. Evgenia Gerasimova of Russia rose from fifth to third overall to capture the bronze. Kim underrotated the second jump on her opening triple toe-triple toe in her short program to Sergei Trofanov’s La Boheme, but followed up with a strong triple flip. The student from Gwacheon City also landed a double Axel and ended her lyrical routine with a nice level four combination spin. She earned 53.64 (30.83/22.81) points for first place. Long skated a fun and saucy routine to music from the Pink Panther soundtrack, opening with a very good level four layback spin, which received positive Grades of Execution (GOE) across the board. The 16-year-old two-footed the landing of a triple flip, but otherwise landed a solid triple Lutz-triple toe and double Axel, placing a close second with 52.24 (30.38/21.86) points. Japan’s Hinano Isobe came in third with 50.14 (28.55/21.59) points. 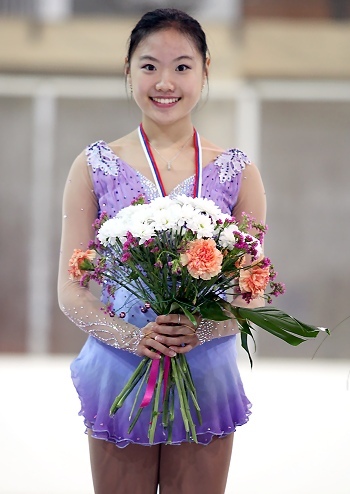 The 2011 Asian Trophy junior bronze medalist landed a triple flip and double Axel, but received an edge call on her triple Lutz (in combination with a double toe). She also earned a level four on two of her spins, and showed good footwork in her innovative routine to music from the Shaolin soundtrack. Laurine Lacavaliere of France placed fourth (47.46) after her upbeat and pugnacious short program to Goodman’s Sing, Sing, Sing. The 16-year-old showed good speed in her routine, landing a solid triple Lutz-double toe and double Axel, but received an edge call on her triple flip. Gerasimova put her hand down after the landing of a triple Salchow (in combination with a double toe) and rotated out of her triple flip. The 14-year-old otherwise landed a triple flip and double Axel in her tentative short to music from The Barber of Seville, placing fifth (46.79). USA’s Courtney Hicks gave a gutsy short program to Bond’s “Korobushka”, but popped her opening triple-triple combination. The 2011 US junior champion rebounded to land a triple flip and double Axel, and showed good level three spins. She finished sixth with 46.63 points. Gerasimova placed first in the long with 96.14 (52.03/44.11) points with her determined and energetic routine to Beethoven’s Symphony No. 5. The student from St. Petersburg stepped out of her second jump on a triple Lutz-triple toe and later put her hand down on the landing of a triple flip. She also received an edge call on both triple Lutz jumps, but otherwise landed a total of three clean triple jumps. The teen also impressed with a level three layback spin which garnered many positive GOEs, and with a total score of 142.93, rose to from fifth to third overall. Long painted a feisty portrait of “Maria” from West Side Story, landing a total of four clean triple jumps. The teen from St. Louis, Mo., turned out of the second jump on a triple Lutz-triple toe, and later underrotated a triple flip and triple Salchow, but otherwise gave a good performance which featured three level four spins. She placed a close second in the long with 94.95 (51.30/43.65) points, maintaining second place overall with a total score of 147.19 in her JGP debut. Hicks, who stood in sixth after the short, placed third in the long with 94.75 (49.51/45.24) points. The 2012 JGP Lake Placid silver medalist landed a triple flip-triple toe, as well as three more triple jumps, but doubled a Lutz and Salchow. She also popped a double Axel, but displayed strong level three footwork and earned a level four on two of her spins in her routine to Aranjuez. The 16-year-old narrowly missed the podium, placing fourth overall with 141.38 points. Kim underrotated the second jump in her opening triple toe-triple toe, as well as a triple Lutz in her yearning long program to Sleeping Beauty. The 15-year-old otherwise landed four clean triple jumps and displayed good spins throughout, placing fourth with 93.66 (48.36/45.30) points. With a total score of 147.30, the she as able to hang onto first overall to win her first JGP title. Japan’s Miu Sato, who stood in seventh after the short, placed fifth (89.35) in the long and overall with 134.48 points. Teammate Isobe slipped to sixth (133.55) overall, while Anna Shershak of Russia finished seventh (130.84). Lacavaliere slipped from third to ninth (124.93) overall. USA’s Alexandra Aldridge and Daniel Eaton won their second consecutive JGP title in Bled, Slovenia. 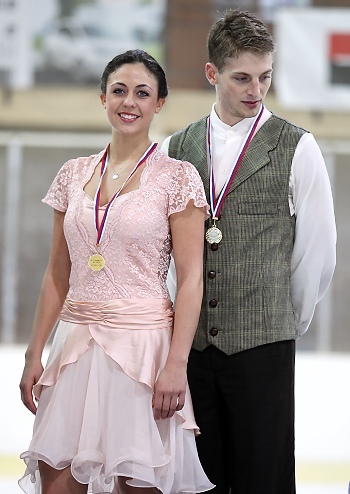 USA’s Alexandra Aldridge and Daniel Eaton captured their second consecutive JGP gold with over nine points to spare. Anna Yanovskaya and Sergey Mozgov of Russia took their second silver, while Canada’s Andreanne Poulin and Marc-Andre Servant won their second bronze. Aldridge and Eaton delivered a powerful, yet joyful routine to Setzer’s Pennsylvania 6-5000 and Harris’ Down Home Blues in which the dancers captured the character of both the swing and blues, along with the forties “feel” of this program. The 2012 World Junior bronze medalists skated close together, meeting four of their six key points for the Blues patterns and earning a level four of their twizzles and rotational lift. They placed first with 58.46 (30.50 /27.96) points. Yanovskaya and Mozgov only met two of their key points for the Blues patterns, however, the 2012 JGP Cup of Austria silver medalists impressed with a nice level four rotational lift and twizzles. The team placed second with 53.53 (26.43/27.10) points for their sultry routine to Bensonhurst Blues and Land of 1000 Dances. Opting for a more modern version of the Blues and Hip Hop short dance, Poulin and Servant performed to music by Usher. Their routine featured a level four straight line lift, good level two twizzles, and the team met three of their key points in the Blues patterns. The 2012 Canadian junior champions placed a close third with 51.57 (26.21/25.36) points. Anna Nagornyuk and Viktor Kovalenko of Uzbekistan finished fourth with 50.99 (27.00/23.99) points for their rocking and upbeat Blues and Jive routine. The team nailed the “Fifties” era perfectly, meeting four of their Blues pattern key points and showing strong level four twizzles. Ukrainians Daria Korotitskaia and Maksim Spodirev nearly tied for fourth place with 50.76 (27.64/23.12) points. Their smooth Blues and Swing number was highlighted by good level two midline steps and a level four rotational lift. Aldridge and Eaton skated to the music from the Fiddler on the Roof and projected a folk dance feeling throughout the routine. The team attacked their program, pushing every element to the limit of safety with power and speed, however, Aldridge caught an edge during the twizzle sequence which resulted in the loss of two levels. Nevertheless, the 2012 U.S. Junior champions otherwise earned a level three on both their diagonal and circular steps and a level four on all their lifts, placing first in the free dance with 79.97 (37.34/42.63) points, and overall (138.43). Yanovskaya and Mozgov scored 75.28 (34.63/40.65) points for their sensuous Middle Eastern themed dance. Mozgov stumbled during the midline step sequence, which resulted in a level two, and their curve lift was only a level one. The team otherwise displayed strong level four twizzles, and their level four rotational lift earned many positive GOEs. The 2012 Cup of Austria silver medalists finished second overall with 128.81 points. Poulin and Servant placed a very close third in the free dance with 75.00 (36.58/38.42) with their animated performance to music from the Fantastic Mr. Fox soundtrack. The team showed good speed in their level three diagonal steps, and produced three good level four lifts. They finished third overall with 126.57 points, trailing the Russians by just over two points. Nagornyuk and Kovalenko produced a good flamenco, but there were a few bobbles during the twizzles and the team experienced a small glitch during their curve lift. The 2011 Uzbekistani national champions finished fifth (65.81) in the free dance and fourth overall (116.80). Sofia Evdokimova and Egor Bazin of Russia finished fourth (67.26) in the free dance, rebounding after a disatrous short dance, and placed seventh overall (109.65). Korotitskaia and Spodirev finished eighth in the free dance (63.71), but maintained fifth overall with 114.47 points. Caelen Dalmer and Shane Firus of Canada finished sixth overall (111.71). Aldridge and Eaton have now qualified for the JGP Final after winning both their events.